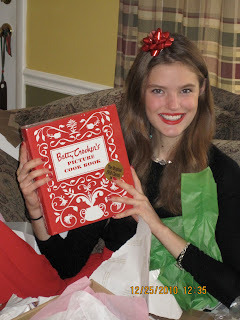 Another Christmas gift I received was the 1950’s edition Betty Crocker cookbook. My grandma gave her original edition to my mom. Unfortunately, it is falling apart. The new cookbook is exactly the same as the original, except its hinges work. One of my grandma’s favorite recipes from it was the cream puffs. So, naturally the first recipe I made was a variation on that: chocolate éclairs. I made them for my Mother Agent’s Christmas package. I made them mini and they were so cute! Heat oven to 400ºF. In 2 1/2-quart saucepan, heat water and butter to rolling boil. Stir in flour; reduce heat to low. Stir vigorously over low heat about 1 minute or until mixture forms a ball; remove from heat. Beat in eggs, all at once; continue beating until smooth. On ungreased cookie sheet, pipe dough 4x1in about 3 inches apart. Bake 15 to 25 minutes or until puffed and golden. Cool away from draft, about 30 minutes. Make one of the fillings (directions below). Fill puffs with filling. And ice with chocolate. Cover; refrigerate until serving. Store covered in refrigerator. Melt shortening and chocolate in saucepan over low heat. Stir in remaining ingredients; beat until smooth. Place pan of frosting in bowl of ice and water; continue beating until of spreading consistency. -Mix in sauce pan: 1/2 c sugar, 1/2 tsp salt, 6 tbsp AP flour. -4 egg yolks beaten. Blend into hot mixture in saucepan and put back on heat. Bring to boiling point. Cool and blend in 1 tsp vanilla.